Having problems with your kegerator? Been dealing with foamy beer causing half empty glasses and wasted beer? Maybe your beer is turning sour or it has an off flavor? Then our easy to follow on-line kegerator troubleshooting guideline is here to help! In this one short article, we can answer all of these questions! Is your tap handle sticking or getting harder & harder to pull? Did you just put the keg in your kegerator? If so then walk away for at least 2 hours to let the beer settle. Wrenching the keg into your car, driving home and then pulling the keg out of your car and putting it in your kegerator agitates your beer quite a bit and this agitation will cause a short term foaming beer problem. Also, the keg has probably warmed up a few degrees and your kegerator needs to cool the beer back down to the proper serving temperature. If you have a foamy beer problem and the beer has been in your kegerator for a while, the first thing to do is take the beer’s temperature. To do this, pour a glass of beer then stick a probe type thermometer in the glass and note the temperature. For any American style Lager such as Bud, the temperature should not be any higher than 38 degrees F. Other beers, depending on style, can be at higher temperatures but no beer should be more than 45 degrees F. If in doubt, ask the brewery or your local distributor. Beer that’s too warm will foam no matter what you do and the only effective solution is to let your kegerators cool down the beer. If you’ve just put the keg in your kegerators and the party’s starting soon you can speed up cooling by piling ice mixed with salt up on top of the keg and catching run-off water with towels as the ice melts. But don’t expect a miracle. Depending on the temperature of your beer, it may still take hours to pull the temperature down to where it needs to be. The best solution is pre-planning – pick up your keg that morning or the day before the party! Look at CO2 pressure only after you make sure the temperature is right. Your CO2 regulator should be set to around 9 – 12 PSI. Some experts recommend 14 PSI but I find 14 PSI to be a little too high for most home kegerators. The correct pressure is the pressure that pours a beer that’s bubble free as it leaves the mouth of the beer faucet. Too little pressure and CO2 will start breaking out in the beer line and will show up as small bubbles coming out with the beer. Too much pressure and beer will be spraying out of the faucet. All kegerators will start depositing beer stone on the inside of the beer lines from the very first keg. Beer stone is actually a lime deposit that comes from the beer. It slowly deposits on the inside of the beer line and will eventually flake & crack. Once this happens, the excessive roughness on the inside of the beer line will cause foaming. Beer stone is not caused by a lack of cleaning or by bad beer – it’s a natural deposit. 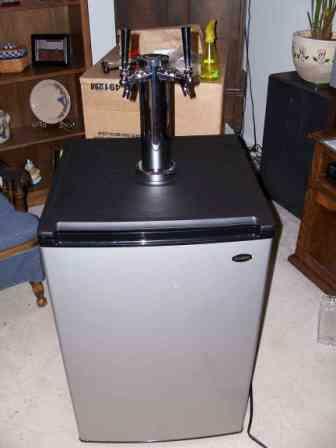 And although there are commercial cleaners designed to remove beer stone, the beer line in a home kegerator is so short and inexpensive that the easiest solution is to just replace the line every 2 – 3 years. Cleanliness is everything to a kegerator and prevention is always better than cleaning after the fact. The first line of defense is to never let your keg coupler fall to the bottom of your kegerators or rest unprotected on any surface, including the top of either keg while changing out a keg. If you do then the business end of the coupler can pick up “who knows what” and introduce an infection into your new keg. Instead, stick the coupler in a clean plastic bag with the gas and beer lines sticking out of the open end to prevent contamination. Next, purchase a small trigger sprayer, the type some people use to mist houseplants and fill it with cheap vodka. Then every day or two, place a bar rag under the mouth of your beer faucet and spray the heck out of the inside of your beer faucet. The alcohol on the vodka will kill anything trying to grow inside the mouth of your beer faucet and the water will flush out any drying beer residue. Follow this routine religiously and you’ll only need to thoroughly clean your beer line three or four times a year. Another cause of foam is improper pouring of your beer. A beer faucet is designed to be fully open or fully closed. But invariably a guest will try to pour his or her glass slowly by partly opening the beer faucet and this always causes foam because the beer sprays past the valve in the back of the faucet. If you have a guest complaining of foamy beer, watch him or her pour a glass of beer then show your guest a proper pour. Dirty glassware can cause foamy beer, but I’m not talking about dirty as in lack of cleaning. Some dishwashing detergents leave a residue on the surface of your glassware that you can’t see but the residue can cause mysterious foaming problems. Commercial glass cleaners are available but it’s cheaper to use a household sheeting / clean rinsing detergent to clean your glassware. Cascade makes a great beer glass cleaner and can be used even if you don’t have a dishwasher, but other products will also work. If in doubt, ask your local bar or club what they use to clean their glassware. A kinked beer line can cause foaming beer, but this is almost never an issue if you use the proper beer line for your kegerator. If you bought your kegerator new, you’ll note that the beer line is very heavy for its ID (inside diameter) of 3/16”. This type of beer line is almost impossible to kink. But many replace their original beer line with thin wall 3/16” ID line from their local home improvement store and the thinner line is very easy to kink, causing foaming problems. The right answer is to pay a few cents more for proper beer line, even if you have to mail order the line. Any new kegerators will come with beer lines that seem too long and some kegerators owners will cut the excess length out of their beer line. As soon as you shorten the beer line you will have a foaming problem because the line is long to help prevent foaming. Your kegerator shipped with 5 ft of 3/16” ID or 6 ft of 3/16” ID beer line and this was no accident. 6' is just the right length to gradually slow down the beer on the way to a door mounted faucet and 5’ is just the right length to work with a beer tower. If you or the previous owner shortened your beer line then you will never solve your foaming problem until you put the length back to where it was. And make sure it's 3/16" ID line because 1/4" ID line offers almost no restriction and will not slow down your beer. A sticking tap handle is almost always caused by drying beer residue plugging up the works. Disassemble your beer faucet and you’ll see that a long shaft rides back and forth in the bore of the faucet and beer is shut off with a seal that closes in the back of the faucet. When you pour a beer this shaft gets wet with beer then the beer that’s left on the shaft dries into a sticky goo. Once this sticky goo gets thick enough the shaft starts to bind inside the boor of your faucet causing your tap handle to stick. Bars and pubs rarely have this problem because they pour more beers per hour than you pour in a day and the constant flow keeps the beer residue from drying into a sticky goo. The answer is simple – just purchase a small trigger sprayer, the type some people use to mist houseplants, and fill it with cheap vodka. Then, place a bar rag under the mouth of your beer faucet and spray the heck out of the inside every day or two. The alcohol on the vodka will kill anything trying to grow inside the mouth of your beer faucet and the water will flush out any drying beer residue. Flat beer is usually caused by CO2 pressure set too low or beer that’s too cold. Beer depends on a certain amount of head pressure (CO2 pressure) to keep the CO2 that was put in at the brewery in the beer. If you pour a glass of beer and sit it on the counter, the beer will eventually go flat. This is because the glass of beer does not have any head pressure sitting on top of the beer to keep the CO2 in suspension. The very same thing can happen to the beer in your kegerator. Set your CO2 regulator too low or even turn off your CO2 bottle between pours and often your keg will start to go flat before you can empty it. This is because you allowed the pressure to drop too low and the CO2 is leaving the beer in your keg, just like its leaving the beer in your glass. But this is an easy problem to fix – just temporarily set your CO2 regulator to 35 – 45 PSI for a while to force more CO2 back into your beer. I can’t tell you for how long – it’s a trial and error thing but I suggest that you start with 2 hours and if 2 hours isn’t enough, do the same exercise an hour at a time until your beer is carbonated again. Just don’t forget to set the regulator back to your pour pressure and bleed off the excess pressure before pouring a beer. The latest craze in bars these days is to serve beer as cold as possible. And although a frosted over cobra beer tower looks neat, super cold beer really means relatively flat beer because the CO2 just wants to sit in the beer instead of trying to escape from your beer glass. So, even though your beer has plenty of carbonation, you get no bubbles and no head on top of your beer glass. The solution to this problem is simple - make sure your beer is not colder than 36 degrees F.
Cloudy beer that’s not supposed to be cloudy can be caused by a bacteria infection. But if this is the case you should be able to taste the infection – the beer will have a slight or pronounced sour taste that does not belong in the beer. If your beer has an infection then I recommend that you invite a lot of friends over to help empty the keg as soon as possible because it will get worse, fast. The infection won’t hurt you, it’s the same bacteria used to make vinegar and that’s exactly what it’s trying to do to your beer. Once your keg is empty and before you tap another keg, thoroughly clean your beer coupler, beer line and beer faucet to prevent introducing the infection into the next keg of beer. Another cloudiness issue is chill haze which is caused by proteins in your beer coming out of suspension when your beer is cold. This is common in some micobrew and homebrew beers and is caused by not removing enough suspended proteins during the mash and brew processes. To find out if your cloudiness issue is chill haze, pour a glass of beer and set it aside. If it’s chill haze, the cloudiness will go away as your beer warms up. Chill haze does not harm your beer. Click here for more details about our beer tower cooler.